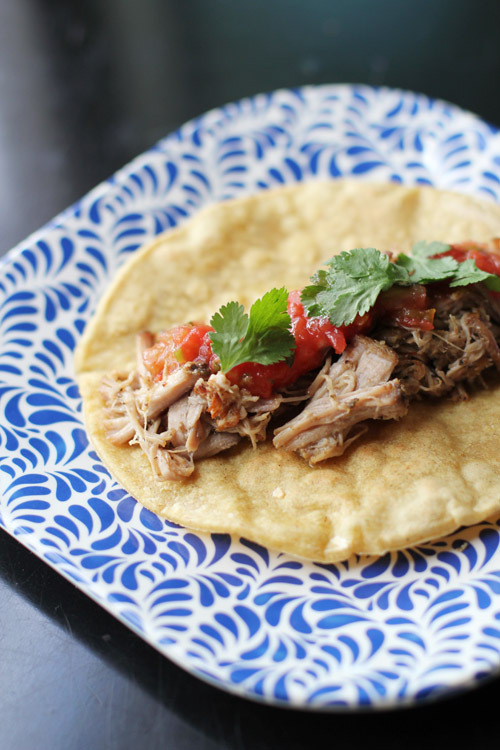 Easy Homemade Carnitas, My New Favorite! I love carnitas. Well, let me clarify, I love good carnitas. I’ve had bad carnitas and, well, not only do I not love bad carnitas, when I’ve had bad carnitas, the experience was traumatic. But good carnitas? 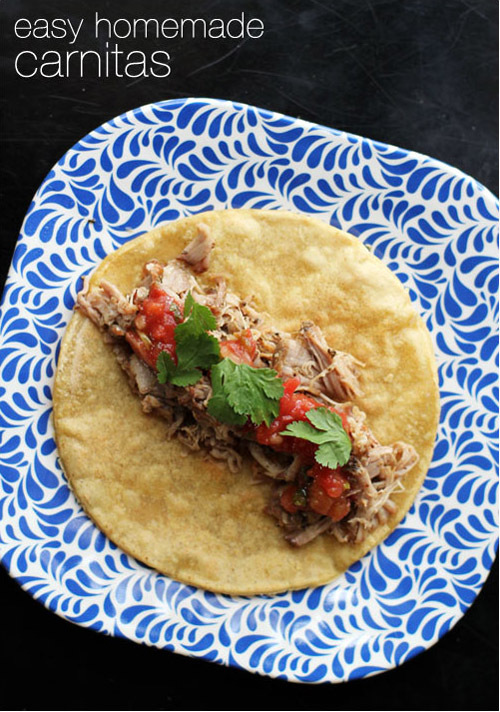 Well, good carnitas are downright irresistible. It’s definitely one of my favorite meat dishes. I live in Southern California where Mexican food is as common as a hamburger, so we’ve been eating carnitas for years, even pre-Chipotle. 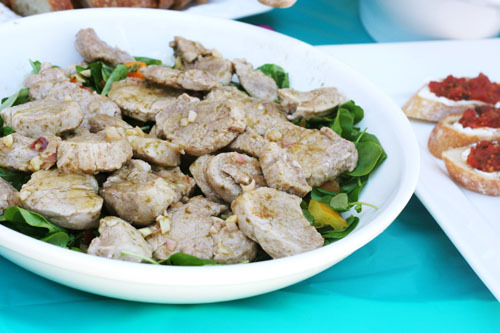 I think most people probably know about carnitas nowadays, but in case you are wondering what the heck I am talking about, carnitas (which translates as “little meats”) is a Mexican pork dish where the pork is cooked for a long time and comes out all tender and delicious like. As you now know, I love these ‘little meats’ a lot, but for some reason I never thought of making carnitas myself. But last week I was like, “Self, why don’t you make your own carnitas already?” And I was like, “Self, you are totally right.” And then I did. And it was awesome. Here’s the thing. The carnitas came out perfectly. So so so so good. And it was crazy easy to make. Also, pork shoulder is my new favorite cut of meat. I am for sure going to use it next time we do Korean BBQ beef tacos. 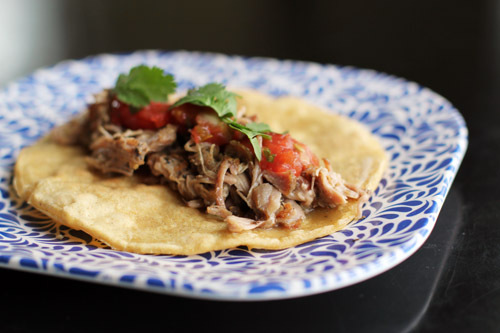 Why was I so clueless about pork shoulder and the fact that homemade carnitas is basically the best thing EVER? And I call myself a food blogger! I had googled carnitas recipes and read through a whole bunch of them and was leaning towards Melissa D’Arabian’s recipe. Then Sara commented on my menu a few weeks ago specifically saying to try that recipe, even though I hadn’t mentioned it, so I figured it was meant to be. The recipe was fabulous and is definitely the one I will use from here on out. Maybe I should do some experimenting but, honestly, when something is this good why mess with it? From Melissa D'Arabian, but I re-wrote the directions to incorporate my notes and changes. Mix together the oregano, cumin, garlic and olive oil. Spread half of the oil mixture on one side of the pork shoulder, flip over and then rub the rest of the oil mixture on the other side of the pork shoulder. Place the onion and jalapeno in the slow cooker with the meat. I put some of the veggies on top and some around the edges. Cut the orange in half and then squeeze the juice into the slow cooker. Place the two orange halves in the slow cooker. Cook on low for 8-10 hours or on high for 4 hours (I cooked it on low for 8 hours). Flip the meat over halfway through cooking. 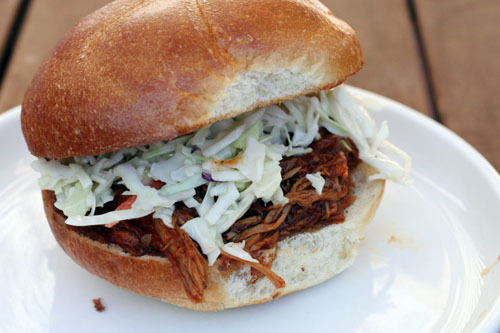 Once the meat is super tender, turn off the slow cooker and remove the meat. Pull the meat apart with a fork, discarding bone if using bone-in shoulder. Heat vegetable oil in a large saute pan over high heat. Sprinkle pan liberally with more salt. Evenly layer the carnitas in the pan once the pan is hot and cook just one side until you get a nice crispy edge on the meat touching the pan. Serve with fresh cilantro, salsa, hot sauce and tortillas. You could also add other items to your taco (rice, beans, tomatoes, lettuce, guac, etc), but Nate and I found that the carnitas were just so good it was better to have a simply-dressed taco. Today’s post is fraught with diversions and side notes. Don’t say I didn’t warn you! Pork chops. There is such a fine line between good pork chops and terrible pork chops that I just usually avoid cooking them altogether. (On a related note, this recipe for pork loin is the best pork I’ve ever cooked or eaten. The recipe is super reliable and beyond delicious. Side note #1 is now complete.) The other day I was thinking about pork chops and thought to myself that the AMAZING technique I discovered from America’s Test Kitchen for cooking steak could perhaps be applied to pork chops. (Side note #2: If you haven’t yet made the perfect steak, what are you waiting for? Seriously, you’ll never cook a steak on the grill again.) The technique involves baking the meat before searing and using a thermoeter. When you follow this technique, the steak cooks very evenly and comes out perfectly every time. Okay, so back to pork chops. 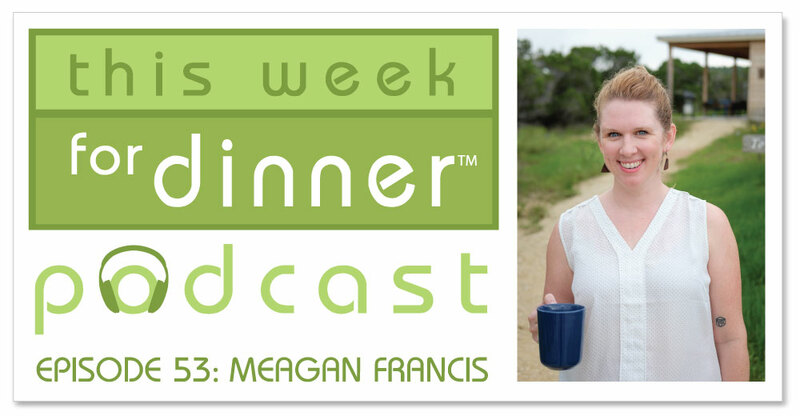 When I toured America’s Test Kitchen in Boston last summer, I got to meet a few of the chefs. As I was ruminating over pork chops this week, I pestered emailed Chef Dan to ask his opinion. He said he thought it would work and gave me some advice, including target temperatures for the pork chops when cooking. SOOOOO…I tried it last night and…it worked! 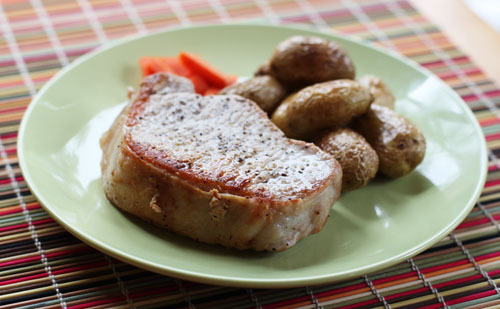 I used the garden variety 3/4″ – 1″ thick boneless pork chops at the grocery store because that’s all they had that day. The pork chops came out not dry (woohoo!) and had great flavor. It’s still pork, so, you know, it’s no filet mignon. But the pork chops were simple and yummy and Anna and Owen could not stop eating them! I am going to try the technique again another time with a different kind of chop and see what happens. But for now, here’s what I did if you want to give it a try yourself! The recipe is nice and simple! Thanks for the advice, Dan of the Test Kitchens! For the record, if anyone cooks this and something goes wrong, blame me and not Dan! Unlike ATK, where they test recipes literally hundreds of times, the recipe below has been tested ONCE by yours truly. That’s what I call thorough recipe development. 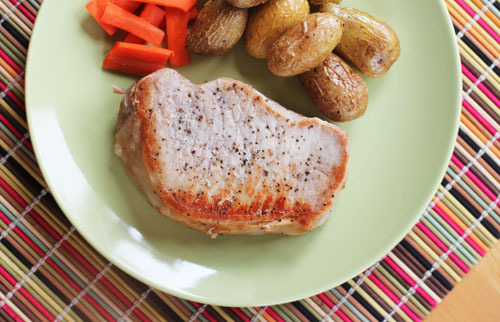 Let pork chops sit at room temperature for about 15 minutes. Pat dry then sprinkle with rock salt and pepper on both sides, pushing the salt into the surface of the meat with your fingers. Line a baking sheet with foil then place a wire rack on the lined cookie sheet (I also put a bit of foil over the wire rack for easier clean-up). 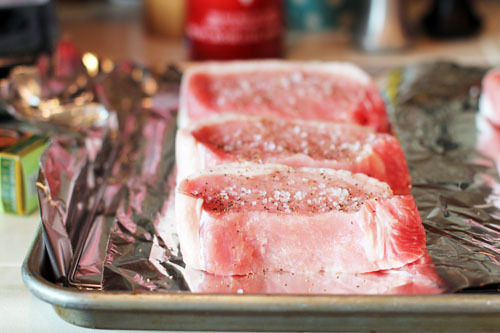 Place the pork chops on the rack and insert an instant read, oven-proof thermometer into the center of one of the chops. Place in oven and cook until temperature reaches 115 degrees F (this took about 30 minutes). When the temperature hits 110 degrees, begin preheating a skillet at medium heat. Drizzle 1-2 tablespoons of oil on the pan while heating and spread it around by tipping the pan. Sear the pork chops (that have reached 115 degrees), about 5 minutes per side, until they reach 135 degrees. Don’t cook them longer than that! Quickly sear the edges just to brown them up and make them look prettier. Let meat sit for 5 minutes then serve. Mix sauce ingredients in a slow cooker. Add pork then spoon sauce over pork just to cover. Pour sauce into serving bowl; stir in the cilantro and shredded pork.